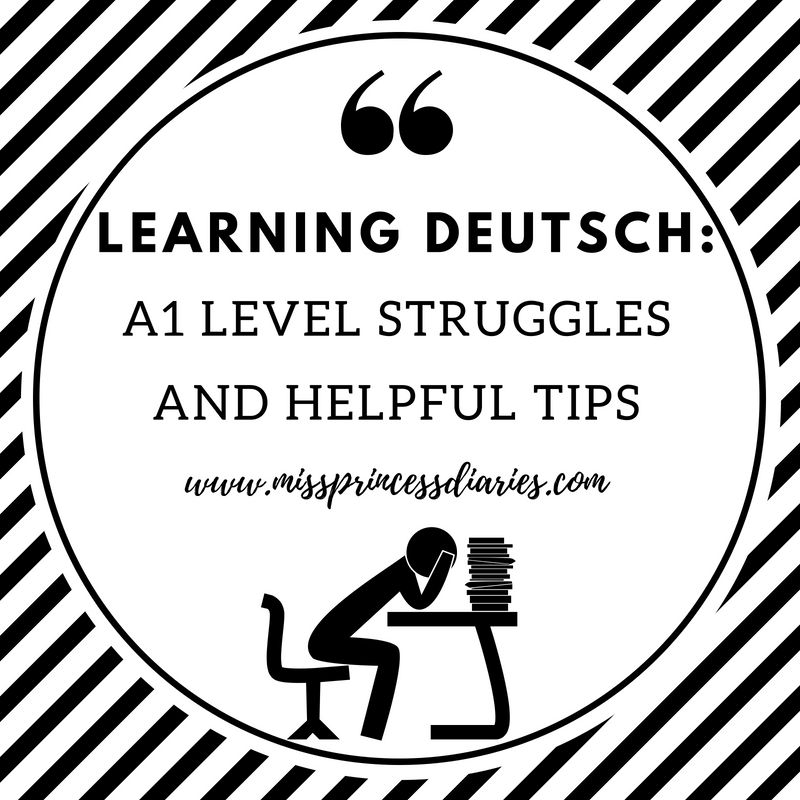 So, you decided to learn Deutsch for some reason may it be for employment, a requirement for something, or you just simply wanted to learn a new language (that's great!). I learned Deutsch for my future employment in Germany. We were enrolled in an intensive Deutsch course in Goethe Institut in Makati. We finished our A1 level for 2 months and took the examination thereafter. The feeling of stepping into our first day of class was the same intensity as if I am a first grader or maybe a kindergarten. Everything will be learned from scratch. I tried to have an advanced review on some Youtube tutorial videos for example, German with Jenny, before I go ahead in my class. My frustration of at least to be able to basically introduce myself in Deutsch was high. LOL! I am just laughing at myself right now. Studying in advance is always good, but what is really important at this time are the specific topics and set of vocabulary for A1. Don't make your memory so full by this time because you have a lot more essential topics to learn. As far as I remember, I wasn't able to focus on my entire A1 class. My adjustment period was longer than I thought and before I knew it, we were scheduled for our very first examination. That was nerve-wracking! Our teacher speaks 99% Deutsch on our entire A1 class. I have a lot of "lutang, sabaw moments" same with my colleagues. "Anu daw ang sabi?" Good thing, our teacher was very patient and interactive. Through her gestures and facial expressions, we were able to cope/ understand some words in a fun way. I studied A1 level the smart way by choosing the right topics to focus on what I needed for the examination. Moreover, I know it may not be important to others, but at this time I gained friends through my schoolmates/colleagues which makes my studying lighter and enjoyable. We practiced together and just laughed at each other. Another thing, I quit working at the hospital since I started my A1 class for me to focus more in studying Deutsch. If you can do work at the same time study, it is up to you. There are many people who did it too and passed. As per Goethe Institut, it is a 4-hour class (with a specific schedule), from Mondays to Fridays. Know how to manage your time well. I am enrolled under Triple Win Project so school fees and expenses were all shouldered. However, transportation, food and boarding (if needed) were all at my expense. 1. Don't stress yourself out. You don't need a lot of vocabulary by this time. You only need some few basic important words to learn and basic grammar. While it is good when you have advanced knowledge, it is even important when you master the basics first. I told you, it is easier to forget than to master especially when you are learning in the PH and not using the language most of the time. Build a good foundation. Don't rush it! 2. Get used to the rhythm of the language. That will be useful in your listening test. There are special set of topics discussed in listening and when you hear it more often, you will get used to it. By this time, listen only on A1 listening topics constantly. The more, the better. Don't force yourself in an advanced level listening, until you are good with the basics A1 topics. Some words are also levelled and may be a different term when you go on a higher level, focus on what you needed for your examination. 3. When you thought speaking will be the hardest struggle you will face in the examination, you are wrong. Butterflies in the stomach, palpitations and sweating were real during my oral examination. I am a hypocrite to tell you to calm down during the oral examination. You will really experience that! That's part of it. Make sure you know your drill! Because no matter how nervous you are, when you know what you will say/do. You can do it, anyway. Composing yourself/ dealing with your nervousness varies. There's no one who will help you but yourself. Watch videos on Youtube on what to expect on the speaking examination, so it will not add up to your stress. At the end, make sure you've said something in your oral examination (duh!). 4. On the written part, it is a trial and error process. You will not totally get it at first try, so you have to try harder and write, write, write! When I was a student, writing is the most uninteresting thing to do. There are basic rules in grammar you have to stick on your mind that will be helpful in your writing because translating from English to Deutsch doesn't work most of the time (if that's what you are doing). Learn how they do it through some written templates you see in your books and learning materials. If you are unsure of it, let your teacher recheck your work and ask for better recommendation on how you will write what you wanted to say. When you prepared what needed to be fulfilled, you will find the examination easier than you thought. Exam preparation is crucial in passing the A1 level. There are certain format in every examination type and you have to get used to it and learn it before taking your examination. When you knew what to do, you don't have to worry much. What needs to be worried about are the next levels you will face. What is also important is that you enjoy learning the language. That's it and good luck in your journeys.